A new bill seeks to track your money and assets incessantly, will enjoin any business with government ties to act as a de facto arm of DHS, and would steal all of your assets — including Bitcoin and other cryptocurrencies — should you fail to report funds when traveling with over $10,000. A court verdict of not guilty doesn’t even guarantee the return of State-thefted property. 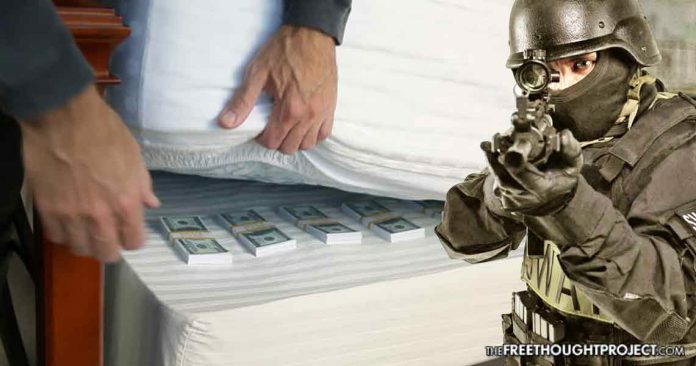 In fact, the government can seize virtually whatever it wants if it so much as suspects some of your assets might have been acquired through or used in the commission of even lesser crimes. For some time, a war on cash has been brewing behind the closed doors of government, and — although officials prefer to claim counterfeiting, terrorism, and money laundering as the impetus for asset tracking — in actuality, physical currency facilitates black market and untaxed transactions, and, most imperatively to the U.S., cannot be thefted under civil asset forfeiture laws as easily as money exchanged digitally. Characterized as an effort to “to improve the prohibitions on money laundering, and for other purposes,” the bill severely curtails the right to travel freely, without undue hindrance, as travelers with more than $10,000 in assets — including those held digitally, like Bitcoin — must file a report with the U.S. government. Noncompliance with the tyrannical law — including failing to fill out the aforementioned form — would incur penalties befitting a fascist dictatorship: an individual could find the entirety of their assets seized, not just those unreported, and could be locked in a prison cage for up to ten years. To be clear, the State wants to write a permission slip to seize all of your assets — bank accounts, including, specifically, “safety deposit boxes,” prepaid cards, gift cards, prepaid phones, prepaid coupons, cryptocurrencies, all of it — even for being remiss in reporting what you’re traveling with. Considering one’s digital assets veritably follow wherever that travel takes them, a cryptocurrency portfolio would theoretically have to be reported each time that person travels outside the confines of the U.S.
Of course, the legislation in actuality just amends laws pertaining to assets and travel already considered dictatorial — right now, failure to fill out the form carries not just the penalty of seizure, but a sentence of up to five years behind bars. “And if that weren’t enough, this bill also gives them with new authority to engage in surveillance and wiretapping (including phone, email, etc.) if they have even a hint of suspicion that you might be transporting excess ‘monetary instruments,’” Simon Black of SovereignMan.com reports. “Usually wiretapping authority is reserved for major crimes like kidnapping, human trafficking, felony fraud, etc. But it wouldn’t just be the government hawkishly surveilling your every transaction, as, essentially, all retailers would be roped into becoming State spies — any business selling gift or prepaid cards would be required to report those, too. Worse — and in defiance of current structures pertaining to digital currency — the government wishes to somehow require issuers of cryptocurrencies into its abhorrent, ostensive money-laundering police spy ring. Travelers possessing assets, precious metals, and accounts in excess of $10,000 held outside the United States, however, would not be required to declare those to the government — perhaps leaving an albeit sketchy option for those wary of unscrupulous authorities. While the government insists ‘If you’ve got nothing to hide, you’ve got nothing to fear,’ the Combating Money Laundering, Terrorist Financing, and Counterfeiting Act of 2017 proves you might not be able to hide anything from its greedy clutches — and if you try, you could wind up thrown in a cage for a decade, penniless upon release. Welcome to America, where your assets are literally the government’s business, and freedom is anything but free.